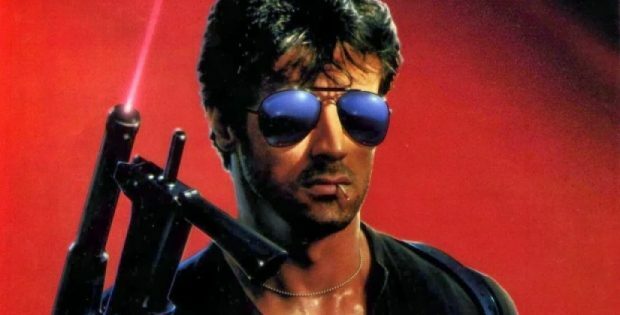 The ’80s was the birth of the over the top action movies. The biggest names were the Planet Hollywood opening night bunch of Arnold Schwarzenegger, Bruce Willis and Sylvester Stallone. They made films where plot holes were covered up with major explosions and firepower. What caused this new genre to take control of the box office and studio budgets? The discovery that cinematic destructive power doesn’t get lost in translation like a romantic comedy or a melodrama. Audiences in various countries didn’t need to read a subtitle to see everything go boom. The ultimate example of this genre hit the screen when Sylvester Stallone made Cobra for Cannon Films. Stallone had made his name doing movies that while action oriented had serious plots and characters dealing with strong emotions such as Rocky, Paradise Alley, Lords of Flatbush and First Blood. But when he created Lieutenant Marion “Cobra” Cobretti, he threw away a multi-dimensional character with emotional depth for an over the top cartoon of the cop who wasn’t going to play by the rules who shot from the hip and the lip. And Cobra turned out to be a remarkable work of mindless genius. The opening act of Cobra is a masterpiece of the era. During the Christmas season, a gunman (The Crow‘s Marco Rodriguez) has taken hostages inside a supermarket. He doesn’t seem to have a demand so much as to do the bidding for the New Order that’s going to be taking over soon. Into the chaos arrives Detective Cobra (Stallone). He’s beyond badass in his tight black outfit, gun with a Cobra on the handle, sunglasses and chewing on a match stick. He’s not your average cop. He sneaks into the grocery store and confronts the gunman. The dialogue is so quotable during the confrontation including when Cobra announces, “You’re a disease, and I’m the cure.” This leads to a clean up in the frozen food section. The opening is so good that we’d run it as a short film at film school. But the good news is the rest of the film is so over the top with action and weirdness that you shouldn’t stop watching only a few minutes into the film. Because it turns out that the gunman at the supermarket was part of a larger trend of guys with axes and sledgehammers who want to destroy America and take over. Super model Ingrid Knudsen (Rocky IV‘s Brigitte Nielsen) finds herself the target by The Night Slasher (Joe Dirt‘s Brian Thompson) and his crew. She barely escapes the first attack. She gets police protection from Cobra and his partner Sergeant Tony Gonzales (Dirty Harry‘s Reni Santoni). But can even Cobra keep her safe from dozens of insane guys on motorcycles ready to hack her away? How does it seem like The Night Slasher is always on their trail? Cobra is so over the top in all aspect that you can’t stop watching until the end of it’s 87 minutes. The action scenes don’t spare a bullet. The axes and sledgehammers smash and crash everything in their swing rang. The film allowed Stallone to once more share the screen with his short term wife Brigitte Nielsen. She was able to use the role to promote her modeling career although the scene where she poses with the clunky robots is hilarious. The element that keeps the movie pumping is Brian Thompson as the unrelenting killer. He has a knife that more fearful than a Ginsu. His character’s relentless nature covers up big questions such as “what’s the point of the New Order?” You just have to fear him slicing and dicing is way through anyone that gets between him and the super model. Most of the time that turns out to be Cobra. Cobra: Collector’s Edition is the finest way to experience the prime ’80s action. The video is 1.85:1. The transfer brings out the details of Stallone’s amazing wardrobe. This was prime Sly. The audio is 5.1 DTS-HD Master Audio. Crank up the volume and let the bullets fly all over the house. The movie is subtitled. Stalking And Slashing (26:00) is an interview with actor Brian Thompson. Is the reason to update from your old DVD of Cobra. Thompson breaks down the entire experience. He has great memories of Stallone including how the script made little sense and Stallone didn’t seem to care. He explains his way of dealing with the guy who rigs explosions on set. He talks about how Cosmatos wasn’t calling the shots on the set. Meet The Disease (24:05) is an interview with actor Marco Rodriguez is about the impact this first act role had on his career. Feel The Heat (14:15) is an interview with actor Andrew Robinson that exposes how his character had a bigger reveal at the end of the film that was canceled. Double Crossed (9:05) is an interview with actress Lee Garlington about playing the woman who set up the attacks. She enjoys playing bad guys and didn’t do this for the art. Her memory of the director involves crumbs on his shirt. A Work Of Art (8:23) is an interview with actor Art LaFleur about how he worked a bit in Italy before working with Stallone as the captain. Audio Commentary With Director George P. Cosmatos is fun to hear after hearing Brian Thompson talk about him. Vintage Featurette (7:50) was gives behind the scenes views of the supermarket scene. Teaser Trailer (1:20) makes Sly look so badass. Theatrical Trailer (1:55) dips deeper into the action with a pumping synth score. Still Galleries (9:54) includes Stills, Movie Posters, and Lobby Cards. Scream Factory presents Cobra: Collector’s Edition. Directed by George P. Cosmatos. Screenplay by: Sylvester Stallone. Starring: Sylvester Stallone, Brigitte Nielsen, Reni Santoni, Andrew Robinson and Brian Thompson. Rated: R. Running Time: 87 minutes. Released: January 22, 2019.